Colin Beattie MSP for Midlothian North and Musselburgh, photographed at the Bonnyrigg branch of RBS which is threatened with closure. Midlothian North MSP Colin Beattie met with Royal Bank of Scotland representatives last week in the Scottish Parliament to discuss the closure of their Bonnyrigg Branch. 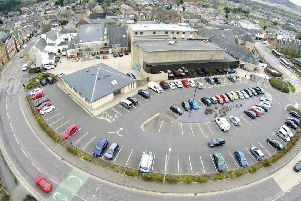 The plans, announced in December to close 62 branches in Scotland, would leave the Dalkeith branch as the only one in Midlothian. Penicuik is set for closure. Mr Beattie said: “I understand the logic of why as a business RBS might decide to close their branch. Reduced customer footfall and the increase in electronic banking are major factors. “However, I took the opportunity to make the point that, as MSP, I have to look at a wider picture than simply short-term profit enhancement. Having a local bank is part of maintaining a sense community and creating a centre for that community. “With so many local facilities, such as libraries, under threat as part of the council’s proposed cuts it is ever more important to try to protect what facilities we can. That is before we consider the inconvenience to customers and any distress to staff who may consider their jobs at risk. An RBS spokesman said that only one per cent of its customers use a branch regularly, while the number of mobile users has increased by 39 per cent since 2015.